We need your help to save the life of a 3 year old Ethiopian child. Feeneet Masarat Mulaatuu Bareechaa became seriously ill when she was 18 months old. Her parents took her to several hospitals in Addis Ababa, Ethiopia and she was finally diagnosed with brain tumor. The parents were told their daughter cannot be treated in the country and were advised to consider taking her to a hospital abroad if they could afford. 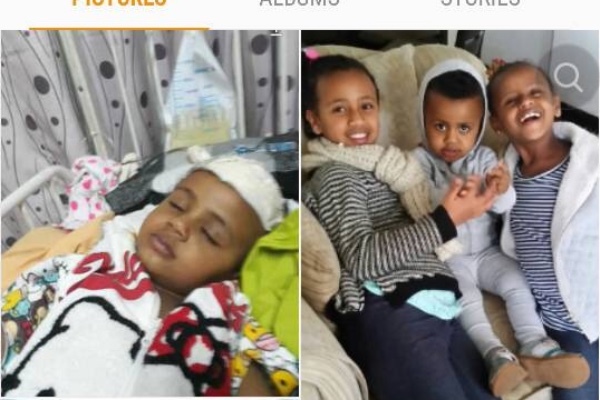 With help from friends and relatives in Ethiopia, the parents took Feeneet to Ankara University Hospital in Turky. The doctors in Turky believe Feenet's life could be saved with chemotherapy and surgery at a later date but the treatment will cost an estimated $35,000. Feeneet started receiving chemotherapy three months ago and the tumor has been shrinking making the parents hopeful. The family has run out of money and they cannot continue paying the medical bills. We are pleading to you to donate whatever amount you can to save Feeneet's life. The fund raised in this campaign will be withdrawn by Solomon Ungashe and wired to a bank account the family opened in Ankara, Turky to pay the medical bills. Please donate whatever amount you can so that we can save a life together. We raised $7,795 from 151 donors in this campaign and $7,475.31 was transferred to my bank account on 5/2/18 after fees were deducted. I have wired $7,430.31 to Meseret Mulatu Bareechaa's bank account in Ankara, Turkey having paid $45 for wiring. Feeneet is undergoing treatment and doing well. Her Mom and Dad are with her and I hope they will go back home to Ethiopia with their happy and healthy daughter. I thank you all on behalf of Feeneet and her parents for your generous support.